Thriller Video was a subsidiary of International Video Entertainment, or IVE, that release 42 horror videos from 1983-1986. That's not very exciting information, except 24 of those videos were hosted by Elvira, Mistress of the Dark. There were 18 other titles Elvira refused to host, or was not asked to host because the subject matter was too violent, or contained violence against animals. Seven Doors of Death and Make Them Die Slowly are among these titles. The titles she did host are mostly re-releases of Hammer House of Horror episodes, some with additional footage not seen on British television. The title were released in both VHS and Beta, the Beta releases containing a gold sticker over the word VHS. I have recently begun collecting Beta copies of the titles hosted by Elvira, and already have The Picture of Dorian Gray, Rude Awakening, and The Silent Scream, my favorite episode of Hammer House of Horror. The Holy Grail here for me is of course The Monster Club, one of my favorite movies ever. Here is a list of the Thriller Video episodes hosted by Elvira. 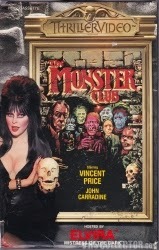 The Monster Club, from Thriller Video, hosted by Elvira, Mistress of the Dark.